The following images aim to give an overview of the style of architectural drawings SYH create and the thoughts and ideas behind them. A common thread that links the selection is the use of bold colour and intricate detail represented in an isometric drawing. 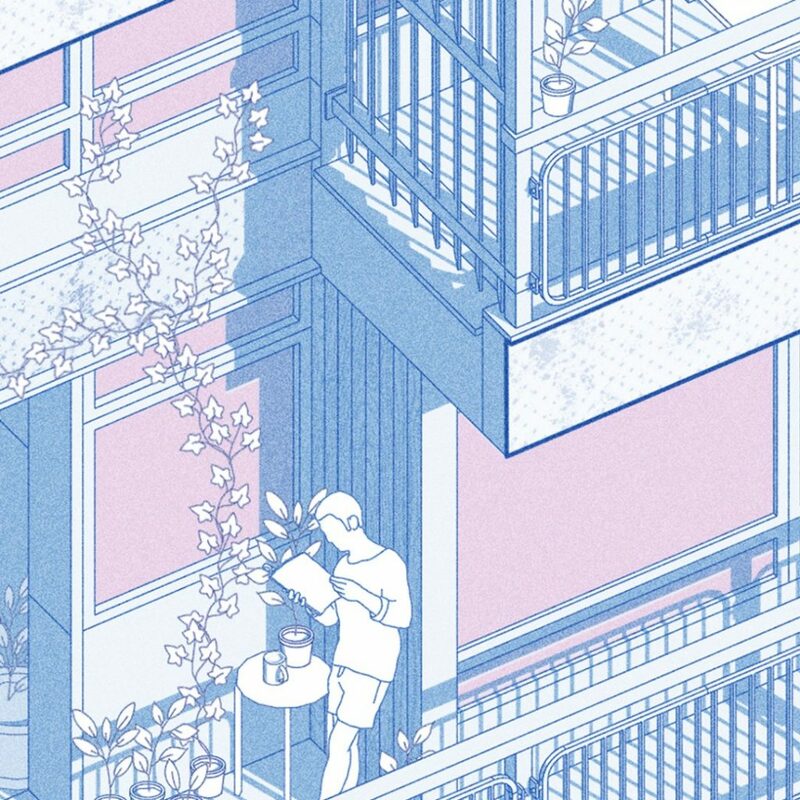 Although the selective images differ widely in terms of location and content, the theme within them generally looks to exploring the way in which people interact with architecture at human scale – generally in a playful, comic manner. Often the architecture that is depicted tends to side towards the exaggerated or extremes – sometimes representing a real location – sometimes a mix & match of influences to create the fantastical. A lot of the work is based around architecture and how overwhelmingly large constructions are appropriated at the human scale. People can find huge constructions so oppressing but often how people live in them are fascinating and inventive. 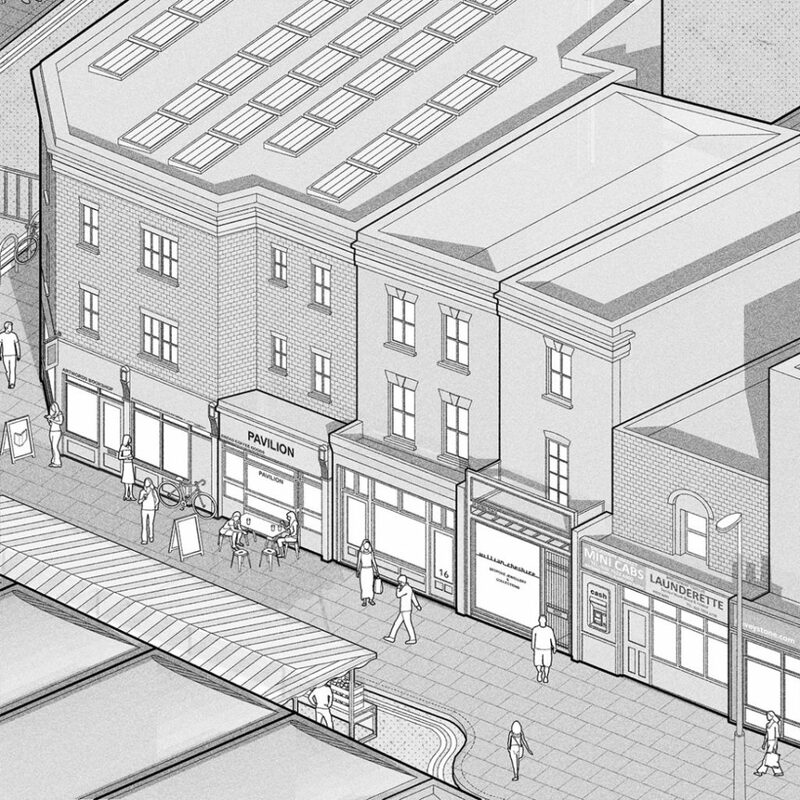 The greyscale images above aimed to represent – to as high detail as we felt possible – a market street in East London. This was one of the earliest illustrations we created – we saw it simply as a stylised, 3D map. Although the architecture depicted has been simplified, it is – to a degree -reasonably accurate; the shop fronts, windows, street activities (including the drunks getting pissed up on a public bench) are accurate of the real street. The idea of someone from the street seeing the image and saying “hey! that’s my house and they drew the chimneys exactly right!” is the aim. Kowloon Walled city is a thing of legend and has always represented an extreme form of architecture. As anyone with a fleeting interest in the city knows, a huge architectural sectional drawing exists and sits on display in the park where the block once stood. The premise for our Kowloon drawing set is basically taking that 2D section and turning it into a 3D isometric drawing. 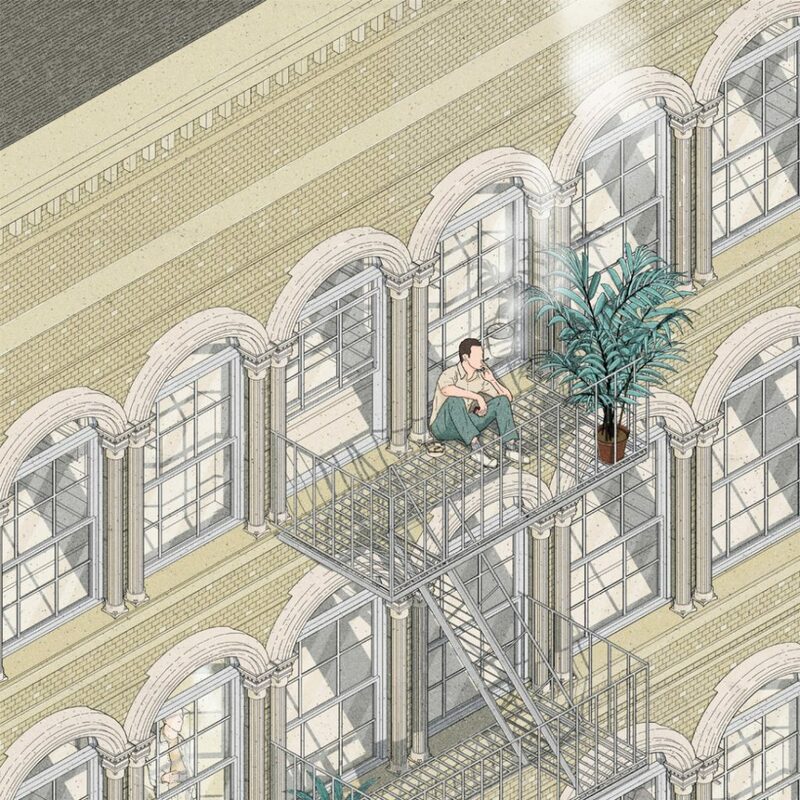 The illustration explores how people find ways of living in the most extreme circumstances. This is an ongoing area of exploration for us. Brutalist buildings have always been a huge inspiration. 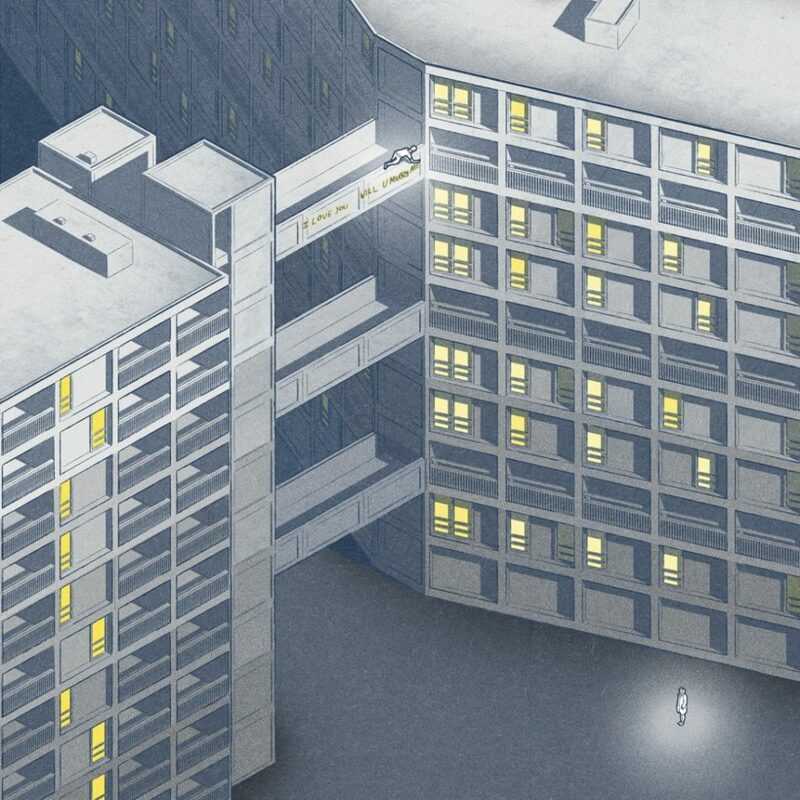 In both the Park Hill and Trellick Tower drawings we aimed to give a little humanity back to buildings that can often be seen as oppressive and overbearing. A concrete balcony full of pot plants or a graffiti love letter scrawled across a walkway are testaments to the occupants of these buildings ingenuity and creativity. Obviously based on Wes Anderson’s film Grand Budapest Hotel, we were unable to ascertain the correct level of details we wanted to accurately represent the building from just watching the film. Fortunately the model makers of the actual scale building used on set took extensive photos of their process and construction. The images can be found online and are fascinating for anyone with an interest in the movie. To list every source of inspiration would be a long and exhaustive job, there is however a common theme throughout our work when it comes to the initial conception of an illustration idea. All the work begins in the same fashion – as an obsessive interest in a single building or a more broad architectural typology. It’s within the research, modelling and drawing of the building you begin to unpick and understand it. An example would be reading a Guardian article about low paid workers living in ‘cage homes’ in Hong Kong and how this became a starting point for an exploration into the extreme’s in which humans live. 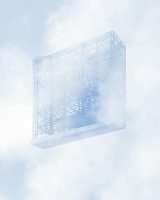 Although a ‘cage home’ is not formal typology, it’s the concept of density pushed to its extreme. 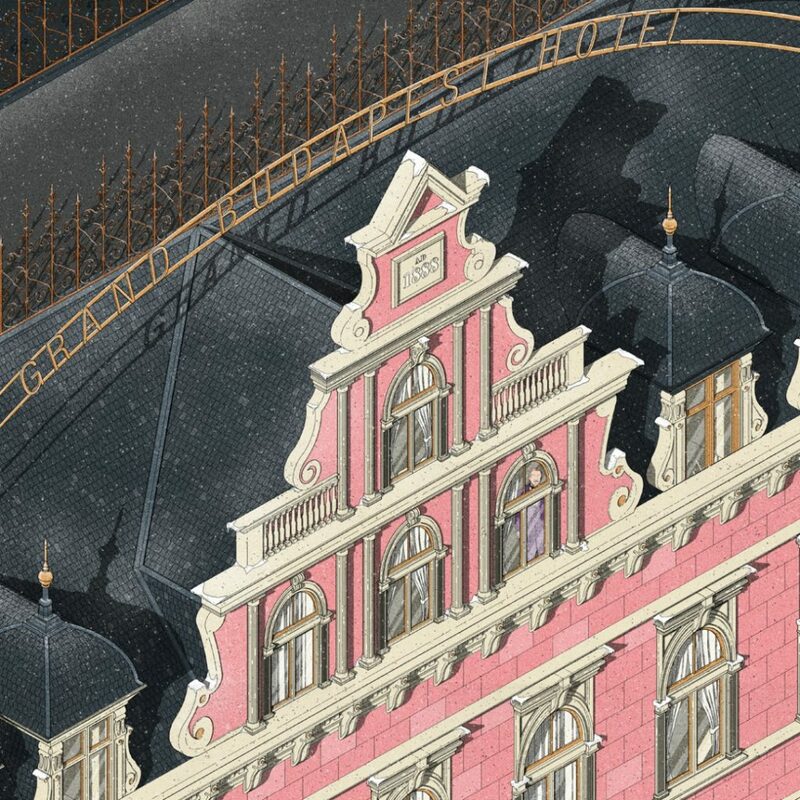 Drawing the Grand Budapest Hotel became an exercise in understanding the formation of different stylised elements to create a fictionalised building. From articles, to movies and architecture how does the world you inhabit effect and inspire your work? We are all from an architectural background and currently all work for architectural practises. Within architectural visualisations over the last 10 or so years there has been a shift away from the ultra slick, ultra glossy rendered images associated with practises such as Zaha or Fosters. 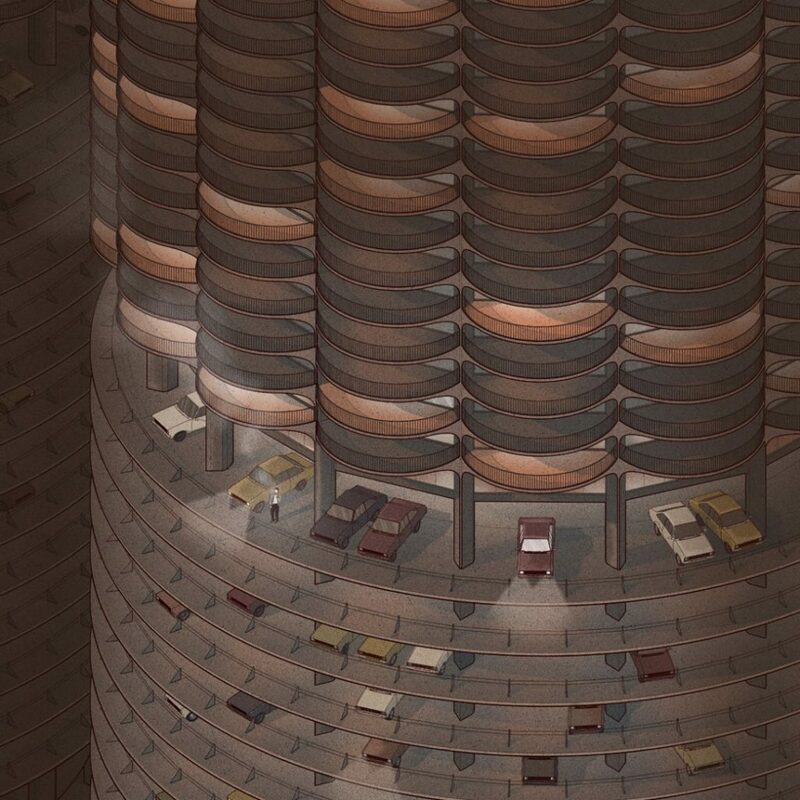 Instead a growing trend to a more textured, analogue approach to architectural visualisation has emerged. Within this realm our illustrations exist, focusing on detail, texture and how people occupy architecture. What define the medium of the drawing as a tool through which you reflect on how humans interact with architecture at a human scale? 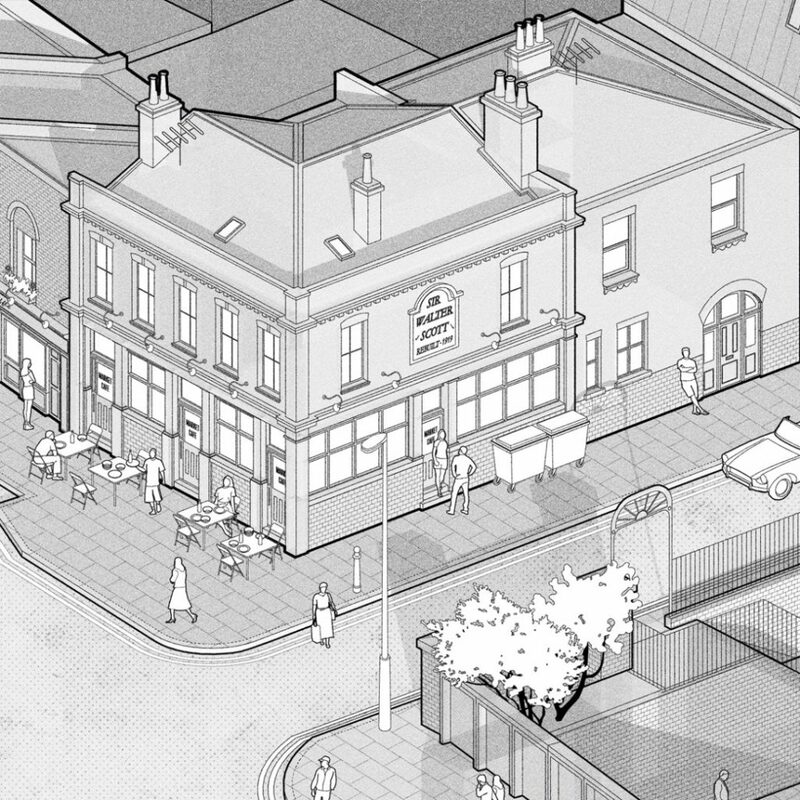 All our illustrations are isometric, which removes an emphasis on a single focal point. 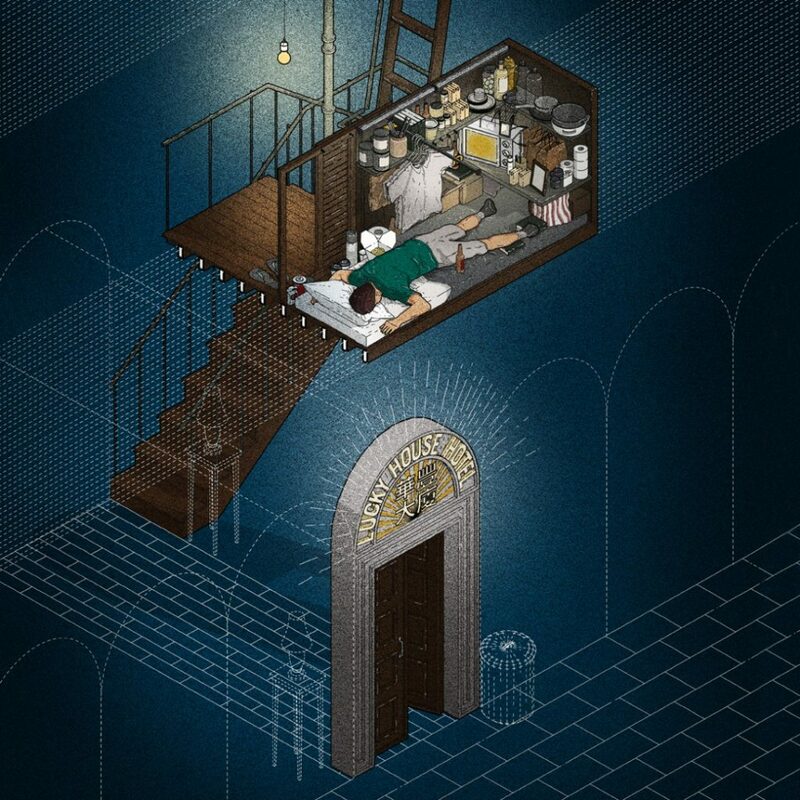 Isometric drawings – as opposed to a standard perspective image – allow for a very uniform reading of an image, prompting the viewer to explore and examine it in its entirety. Where a perspective may place an emphasis on the a person doing a specific act, an isometric places an even emphasis on the person, the act and the surroundings in which they are doing it. Our illustrations are about all three aspects and not any single aspect alone. What is your work process in terms of concept development and drawing? To what extent is the drawing used as a tool in the process of making? Original concepts and layouts are quickly sketched out to brainstorm ideas – however, once the basics of the design has been agreed, the project is moved to an entirely digital format. Having said that, even though the image is entirely digital, it continues to be tweaked and modified as the process progresses. What tools do you use? What is the role of the digital within your way of working? Generally, the basic elements of the composite are modelled in 3D. The shadows and lines then exported in 2D to Illustrator where the line weights can be adjusted to suit. Once the basic scene has been formed, it’s exported to Photoshop where an digital stylus is employed to add detail. Using an digital stylus adds the variety which comes with hand drawn illustrations. Previously, we used tracing paper to transfer analogue sketches to Photoshop, however, the process of sketching, scanning, adjusting tones proved too time consuming when similar – if not better – results can be achieved digitally. What is ultimately the objective of these works? 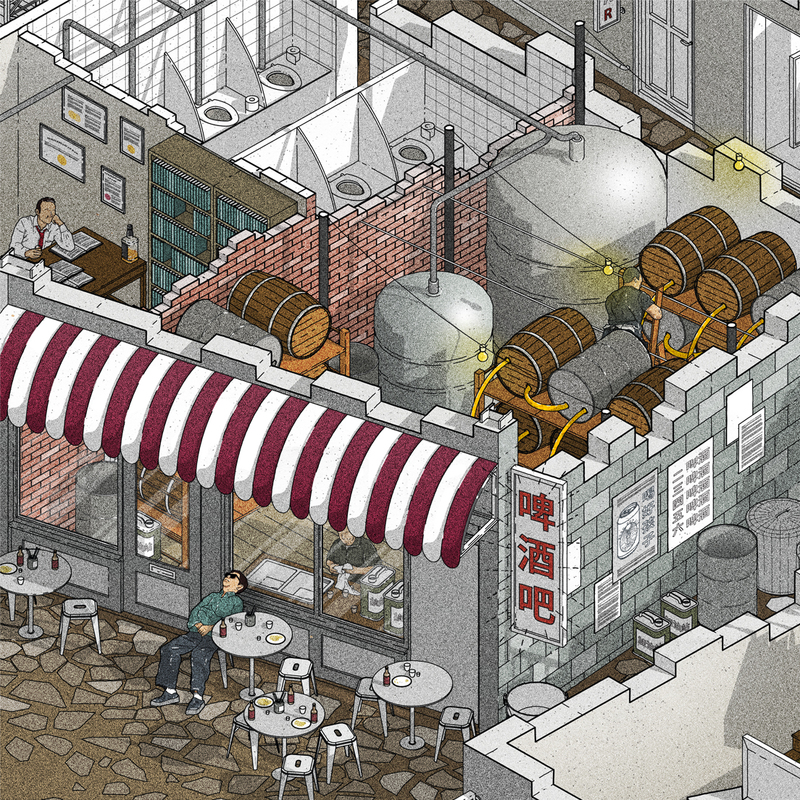 Put simply, the illustrations aim to show people interacting with architecture. Hopefully some people enjoy looking at them as much as we enjoy creating them.